British commuters who are wearily used to travel and public transport hold-ups found that snow and delayed engineering works on the East Coast mainline meant that many had to abandon their journeys. A £200 million (US$311 million) engineering project to install overhead power cables on the East Coast mainline just north of King’s Cross, scheduled for Christmas and Boxing Day, has overrun – meaning that trains are being terminated at Finsbury Park, a few miles north, or Peterborough. 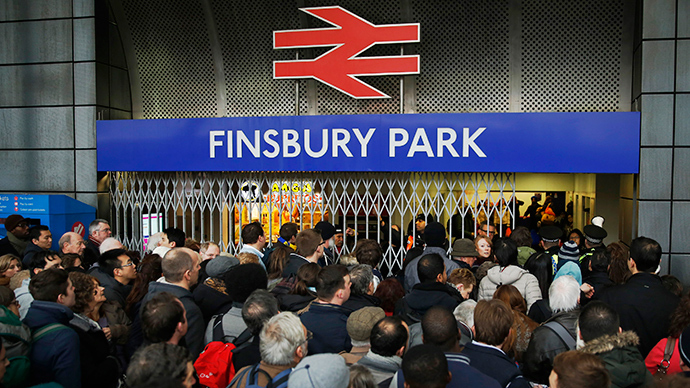 The result has been chaos and overcrowding, as Finsbury Park only has four platforms – compared to a dozen at King’s Cross. Other trains have simply been cancelled, meaning the ones that are running are massively overcrowded. The West Coast mainline from Euston is also closed for engineering works, so the only viable routes north are by East Midland Trains from St Pancreas or from Marylebone to Birmingham Snow Hill – meaning that these routes will also be severely overcrowded. A spokesman from the Department for Transport laid the blame for the delays on Network Rail. That is a serious line MT @chrisctturner: #finsburypark: http://t.co/zFnFyLBWuU. “It is extremely disappointing that Network Rail’s engineering works have overrun and will affect travellers during this festive season, passengers will be rightly annoyed,” he said. The Office of Rail Regulation is to launch an investigation into the major disruption to passengers caused by the delayed engineering works, and Transport Secretary Patrick McLoughlin is demanding an explanation from Network Rail – which is responsible for the UK’s rail infrastructure. Britain’s airports were faring little better, with a number of flights from Manchester delayed. In one case, a pilot resorted to phoning the police. A pilot for Germanwings on a flight from Manchester to Hamburg became so frustrated with the three-hour wait to get his plane de-iced that he ended up dialing 999. There was only one vehicle at Manchester airport capable of de-icing planes, and after getting no reply following several attempts to contact airport authorities, the pilot phoned police in desperation. “It was getting pretty hot and all the food was gone. There was about 150 people on the plane, people were getting frustrated. No-one was coming back to the pilot, so eventually he called the police. He said he couldn't tell us anything because he couldn't get hold of anyone – he said no one was responding,” said Mr. Adam, one of the passengers, as quoted by British media. “Spent a week in an alpine country and where do we get stranded thanks to snow? Manchester airport,” passenger Natalie Merchant told the Daily Mail. Once police left the plane, some passengers went with them. Others remained on board and were diverted to Hanover. Other flights, including routes to Belfast and Paris, were unable to take off. Liverpool and Leeds Bradford airports were closed Friday night, but have now re-opened. In other developments, 36,000 people in the west of the country were left without power on Friday night. Many of those were still suffering disruptions to their electricity throughout Saturday. In the East Midlands, hundreds of homes are still without power.